After a month of temperature either below zero or just above it, it was so nice to arrive in Portugal to blue skies and gentle breezes. We were still wearing all of our layers from Warsaw, and almost melted on the short walk from the train station to our Lisbon AirBnB. 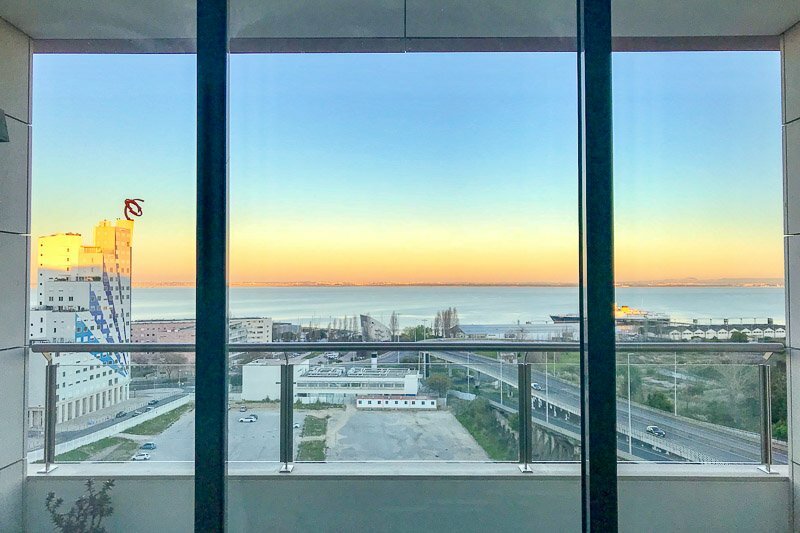 I had been looking forward to getting here, not only for the warmer weather, but we were staying in our own apartment for a whole five days! The last six weeks had been pretty crazy. We had moved about every three days, sometimes not just cities, but whole countries away. I was verging on exhaustion and was really excited to now be having a break somewhere where I also had a washing machine and kitchen. Discovering we had beautiful sea views and the supermarket was only about 200m down the road just made my day! Small things, I know…. 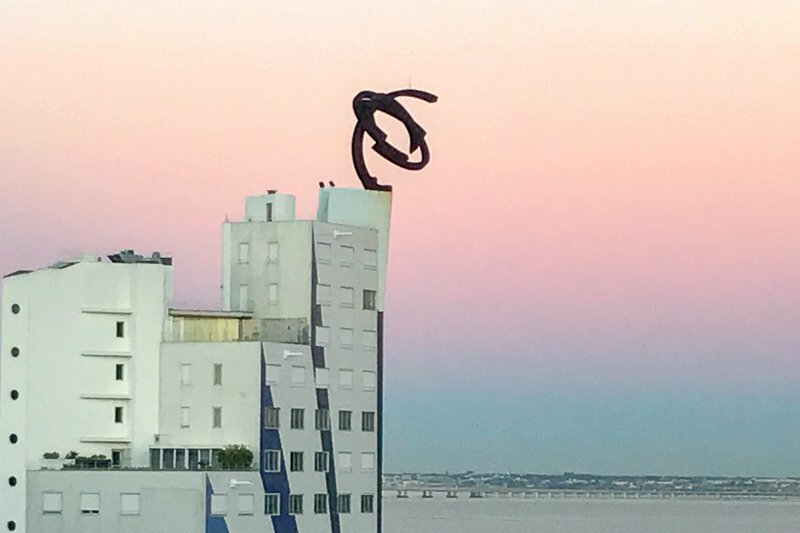 The view from our AirBnB on our first night. Okay, the foreground may not be too pretty, but the water, the sunsets and the sunrises made up for it. So a lot of our time in Lisbon was spent just hanging around and chilling out. We had five nights here, but really could have done with a bit longer since we took it so easy. We did get out and have a bit of a look around the city, starting, as we ofter do, with a free walking tour around the centre of the city. We again went with the Sandemans tour. We seem to have gravitated towards this company a lot lately. These guys are the ones who started the whole free tour concept in Berlin, after the founder had been on a rubbish walking tour and wondered why he should have to pay for something he was not happy with. I think he got something right with the free tours, because every single one I have been on the guides have been enthusiastic, interesting, and many have gone above and beyond to help people or just hang out for a bit afterwards. The guides probably make more money this way too, because I think a lot more people do these walking tours than if they were paid. It’s also much easier for people like me who don’t like to book too far in advance, and instead can just turn up on the day. The Lisbon tours were crazy. There were both English and Spanish tours leaving at the same time with multiple groups of each. I think our group would have easily had over thirty people in it. If each person tips just €5 each (and most would pay more) then that’s a decent pay for someone in a city that has an average wage of a bit over €200 a week. So don’t feel bad that the guides are doing this for “free”. 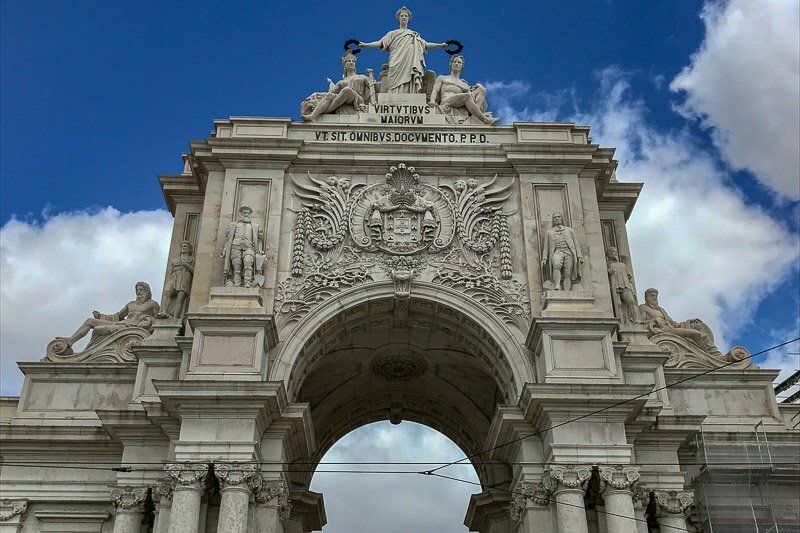 We spent about three hours walking around the city centre and learning about the different landmarks, buildings and history of Lisbon. While the site itself has been continuously inhabited for about 3000 years, the buildings we see today are relatively new thanks to a huge earthquake in 1755 that destroyed most of it. 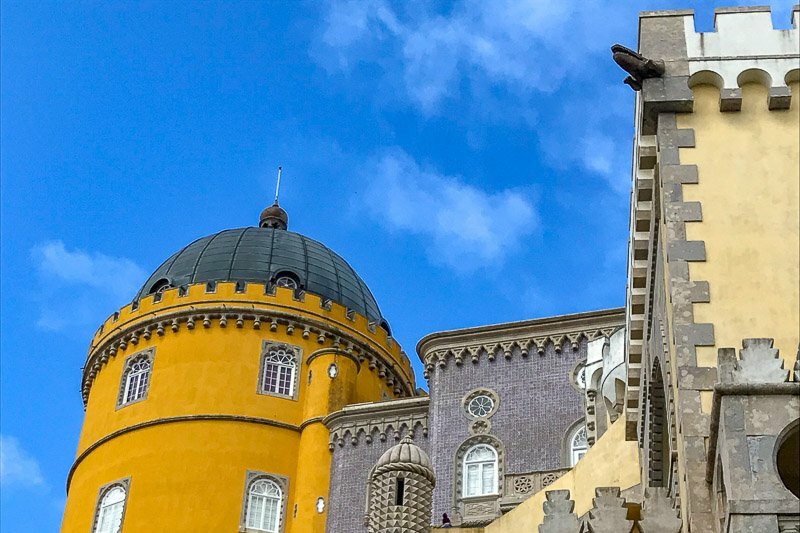 It was rebuilt in the current extravagant style when Portugal was one of the most influential empires in the world. 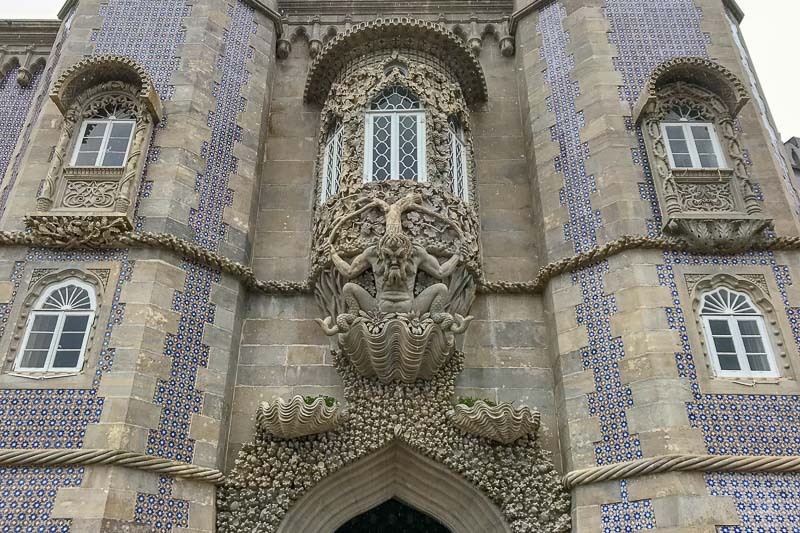 Many of the buildings are beautiful, decorated on the exterior with the distinctive, colourful Portuguese tiles. During the nineteenth and twentieth centuries Portugal lost all of it’s colonies and went bankrupt more than once trying to fight to hold on to them. The world was changing but the Portuguese Empire was not. The people were not so happy about their diminishing fortunes, so there was an uprising in 1910 and the last King of Portugal, Carlos I and his son and heir were murdered. Of course, it was a case of out of the frying pan and into the fire with the leadership of the country now in the hands of the dictator Salazar. Add to this mix the Roman Catholic Church who also liked to have a fairly big say in running the country, and even the recent history has been a bit turbulent. 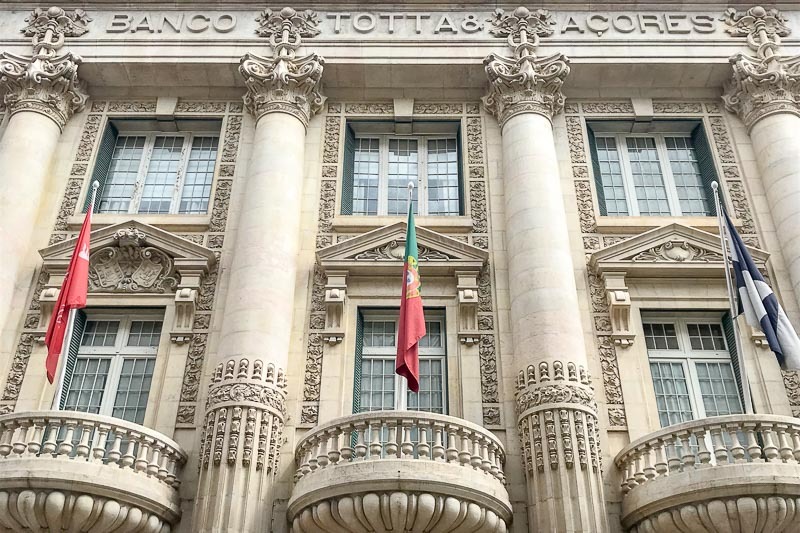 It wasn’t until 1976 that Portugal’s first Constitutional government was put in place. In 1999 Macau was handed back to the Chinese, finally ending the longest colonial empire the world had ever seen. Much of the recent history was a surprise to me. 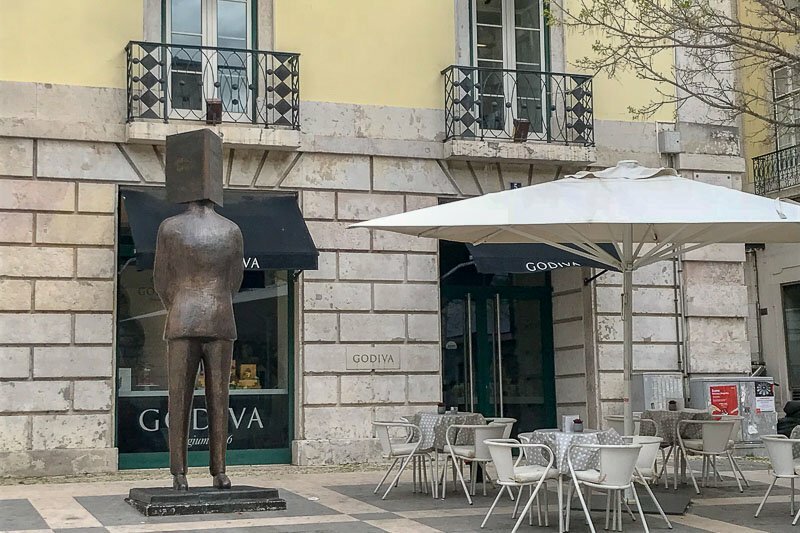 Lisbon seems to be such a forward thinking city. 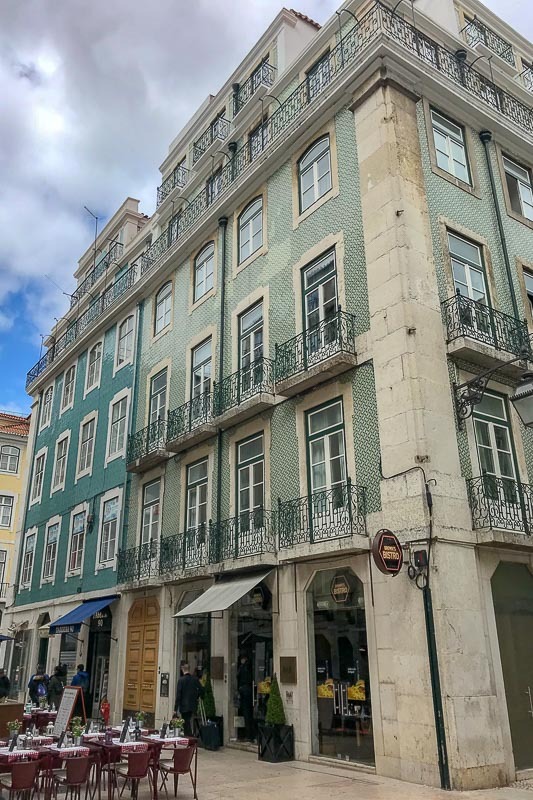 It has a real cosmopolitan feel about it, and I can imagine that in summer it is really pumping with an amazing vibe as the streets of Bairro Alto overflow with locals and visitors alike. These ruins remain standing after the 1755 earthquake. This was a former convent. 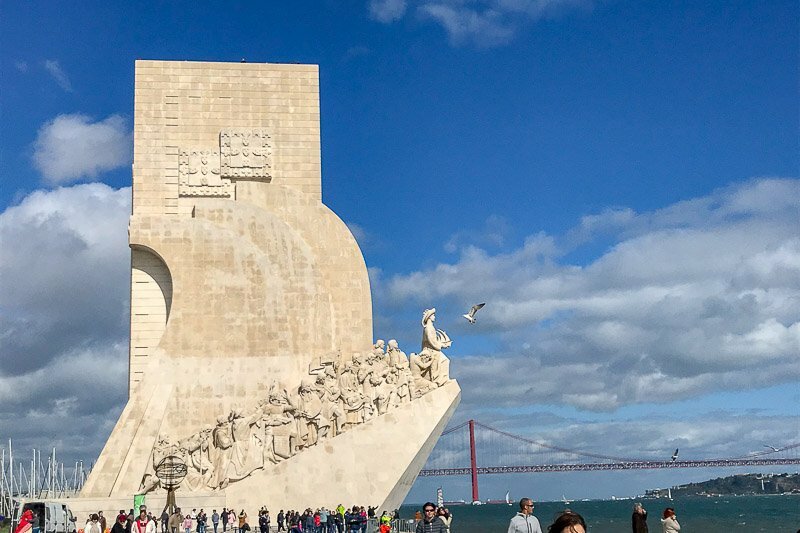 We enjoyed the walking tour so much, and our guide was fantastic, so we decided to join her in the afternoon for a paid tour to Belém. 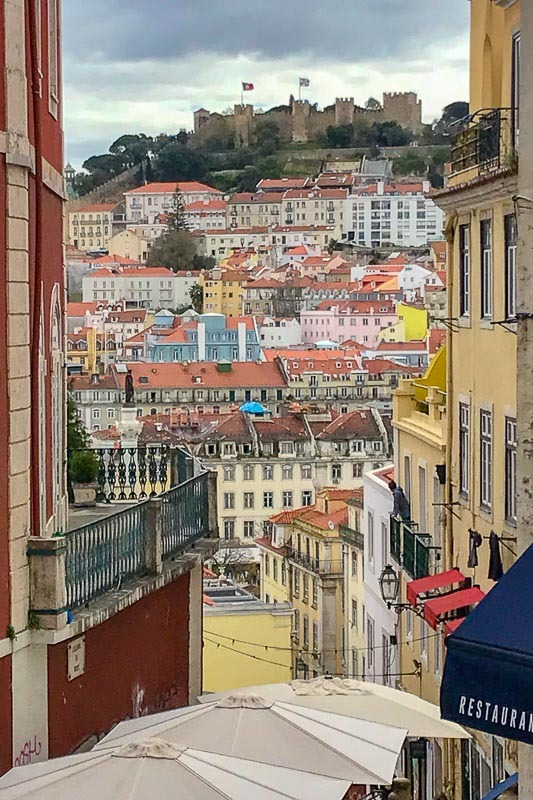 This seaside neighbourhood of Lisbon is where many of the large historical sites are with lots of public spaces. There are also many grand buildings in the area as it was where many of the nobles decided to rebuild their palaces and houses after the 1755 earthquake. 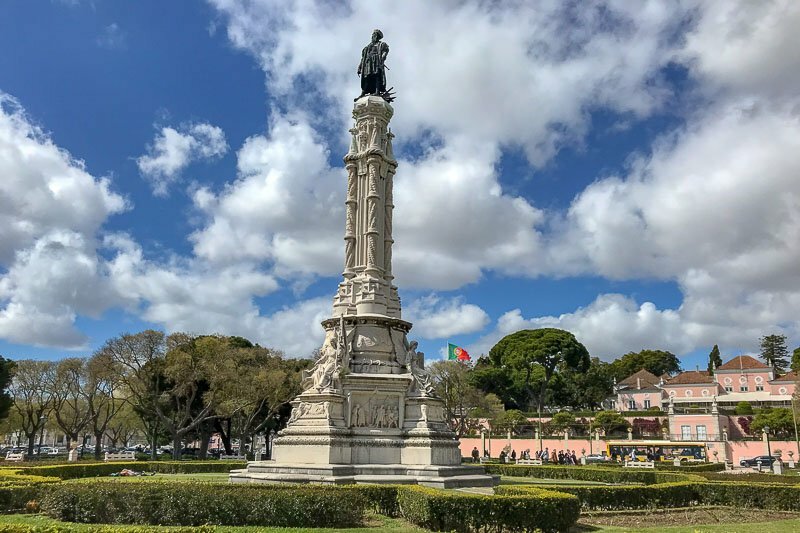 While Belém is a great area to learn about the history of the Portuguese explorers, it is famous for something else – the Pastel de Belém. Closely related to the pastel de data, or Portuguese egg tart, there is a shop that has been producing this special Belém version since 1837. The shop has barely changed in all that time, which absolutely blows my mind because it is as old as the state of South Australia where I live (first settled, 28th Dec 1836!). 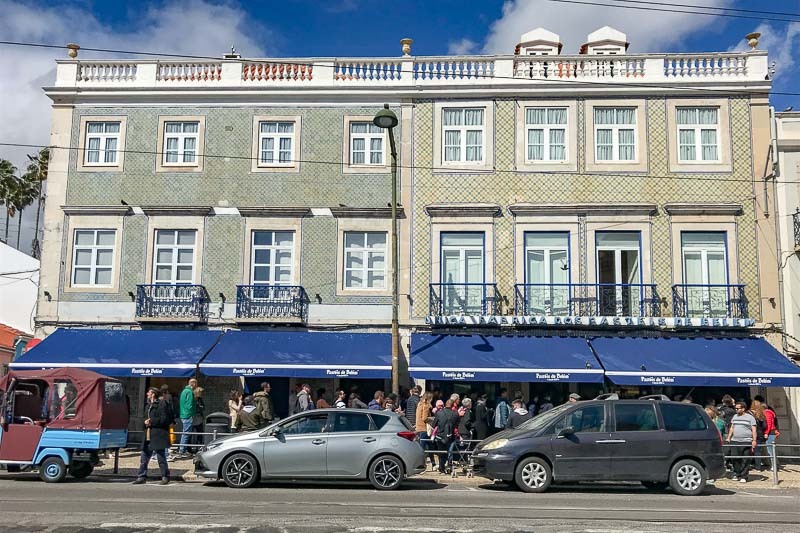 There is always a big long line (sometimes hundreds of metres) out the front of the shop as locals and tourists alike wait to get their share of the best egg tarts in Portugal. Luckily for us, our guide has an arrangement with them, and could duck in the side door and get some for us to try. I was so excited about these, I completely devoured mine before I thought to take a photo. So delicious. The delicious Pastel de Nata. Not the Belém version, but they look pretty much the same. 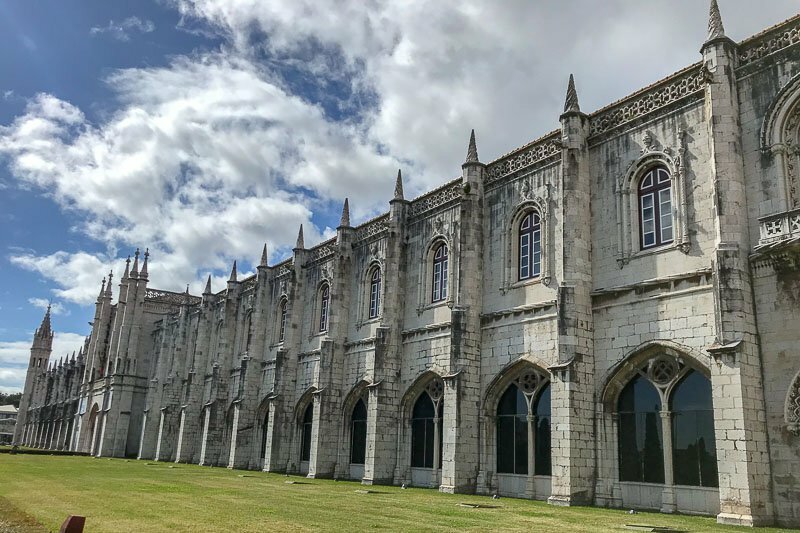 Possibly the most well known building in the area is the impressive Jeronimos Monastery. Built mostly in the sixteenth century, but replacing earlier buildings on the same site, it now houses the National Archeology Museum and the Maritime Museum. 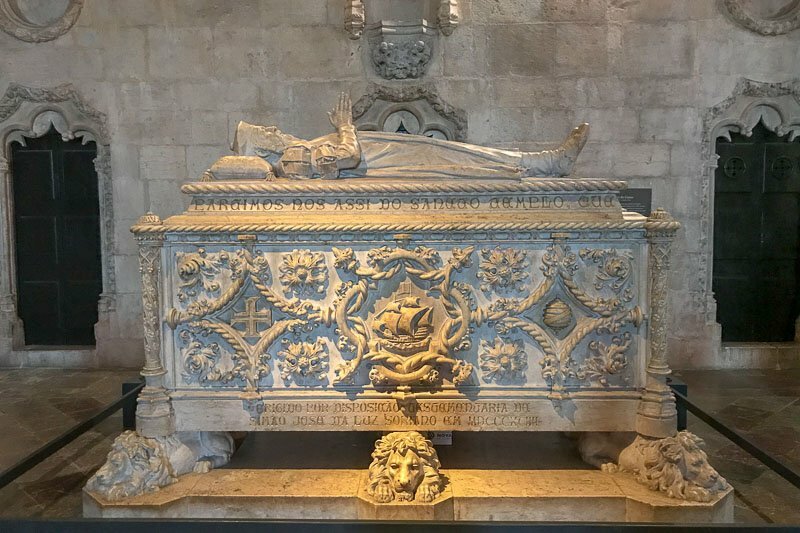 There is also still the stunning gothic Church of Santa Maria that contains the tombs of both Vasco de Gamo and Luís de Camões. Luckily these buildings escaped the earthquake almost unharmed, so we can still appreciate them. 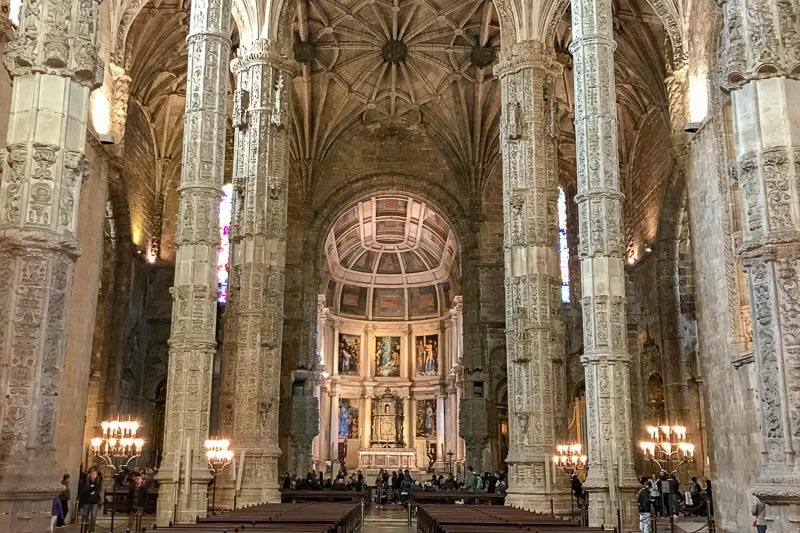 Inside the Santa Maria de Belém church. Can you see R2D2? 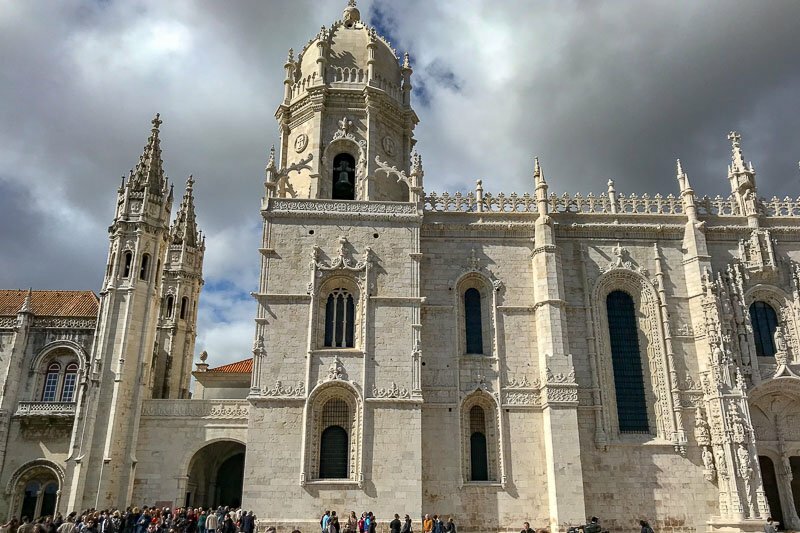 We continued on through Belém, checking out some of the many monuments and buildings. 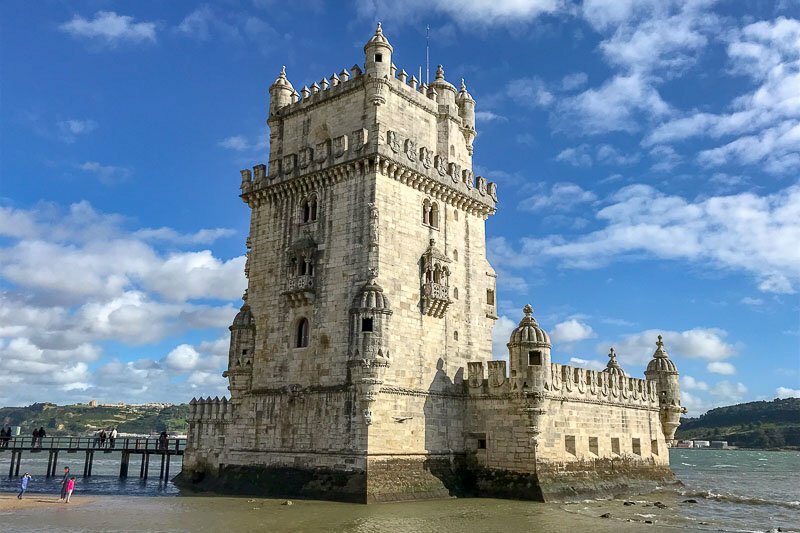 Some, like the Belém Tower have many years of history, others have been built in more recent times, mostly by Salazar to give the impression of wealth and solidarity, and giving public spaces to the people. As our walking tour ended, those fluffy light clouds turned grey and menacing, and with thunder and lightning following us, we hurried back to the train station to make our way home. We did of course end up getting a little wet, but in terms of our luck with rain, it wasn’t too bad. 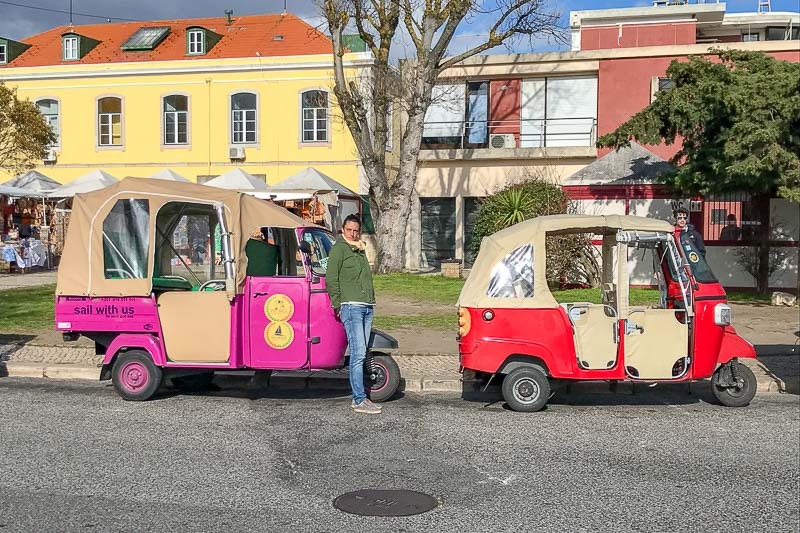 We also came across these tuk tuks parked, and were really tempted to jump in one of them instead. The following day we explored more around the area where we were staying. There’s a nice long seaside path, which was being well used on a cool and windy day. The cable car along the waterfront seemed to be a popular attraction. Near where it ends is an aquarium, but for once, I won the argument about whether or not we visited and we kept on walking. 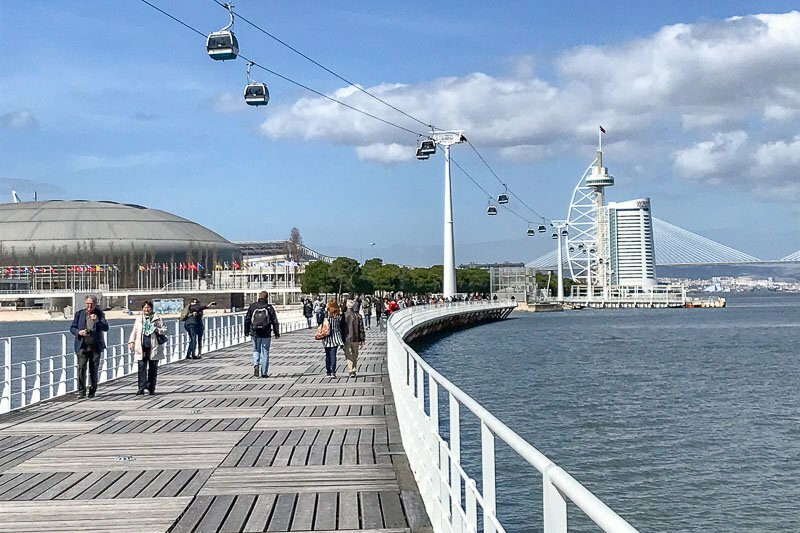 The foreshore of Parque das Nações has been turned into a great public space, and even though the weather was only so-so, many people were out enjoying it. 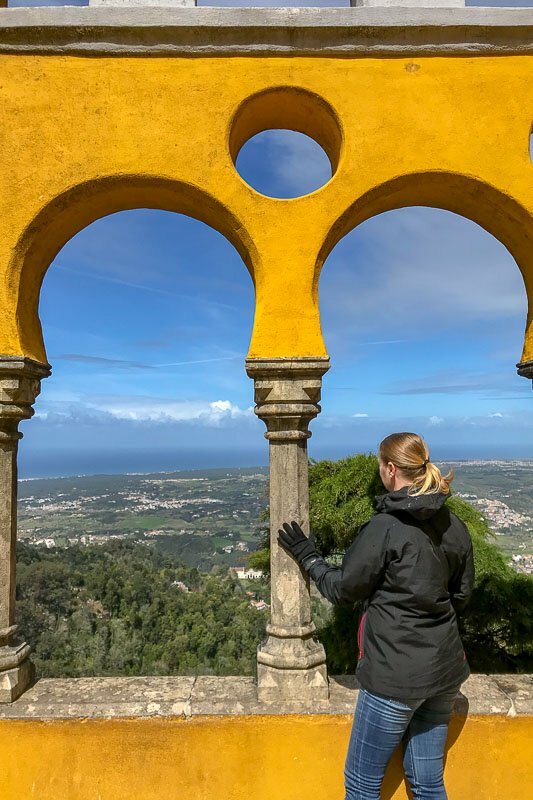 The one thing I really wanted to do while we were in Lisbon was a day trip to Sintra. The trains left from the Oriente station, which was conveniently close to where we were staying. It was an easy trip of under an hour. As we emerged from the train station at Sintra we were bombarded by people selling us tours, bus tickets and entry tickets. 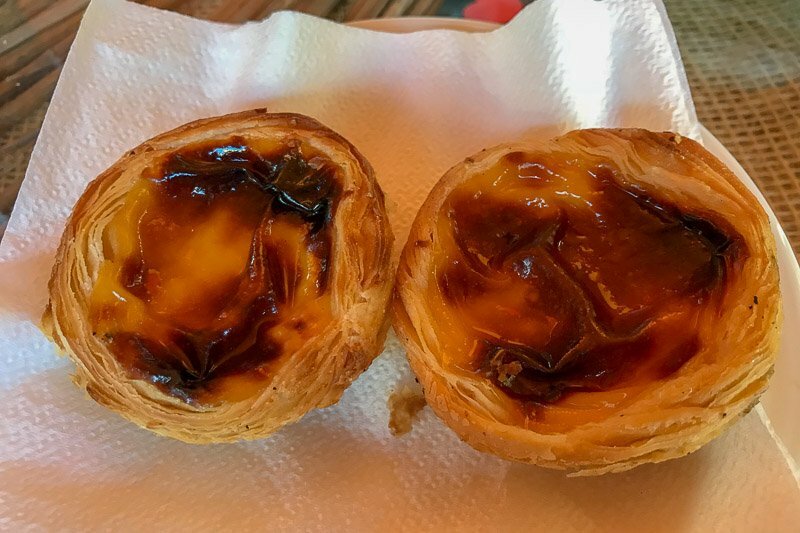 Rather than be pressured, we headed to a coffee shop, grabbed coffee and a pastel de nata, and looked online at the options we had been spruiked. We decided to pay €20 each and get on the Hop On Hop Off bus. It had two loops, and we worked out we should have time to do them both. 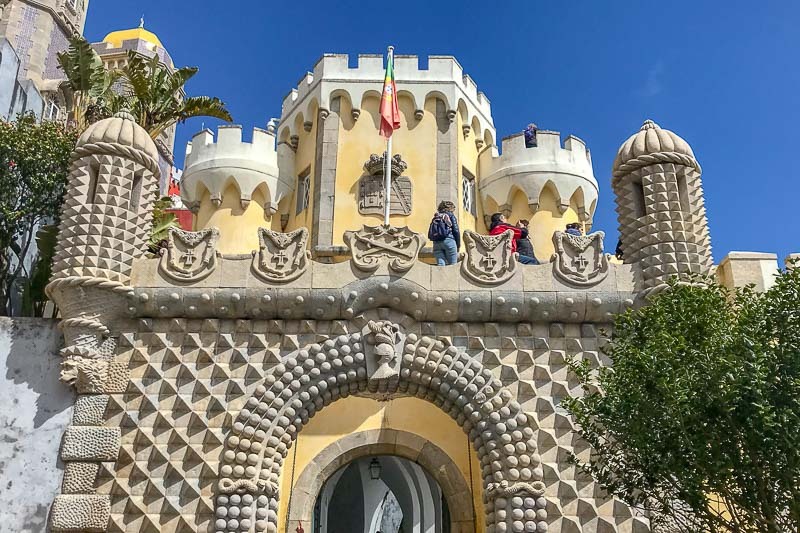 The first part of our trip took us to the amazing Pena Palace. We chose to just look around the terraces and the grounds rather than go inside to see the museum, and what a good choice that ended up being! The line was so long, and as we looked around, the rain started, and everyone in line was getting soaked! I used the rain well though. While everyone else ran for shelter, I took the opportunity to get some photos of the empty courtyard before taking shelter myself in the little chapel in the side of the palace. The rain came down and everyone ran for cover – except crazy people like me that wanted to get photos with no one else in them. After exploring the palace, we went for a walk around the grounds. 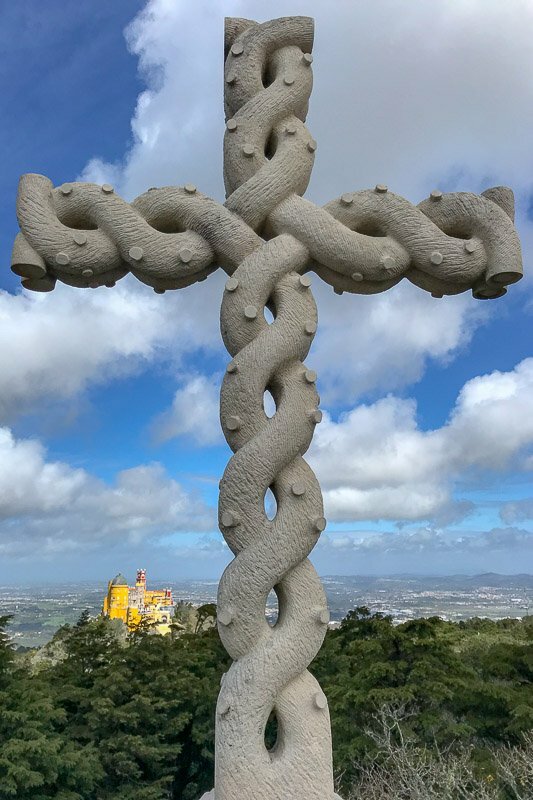 First we went up to a nearby hill to see the Cruz Alta, literally the High Cross. This one is actually a replica that was placed on the top of the hill after the original was hit by lightning in 1997. 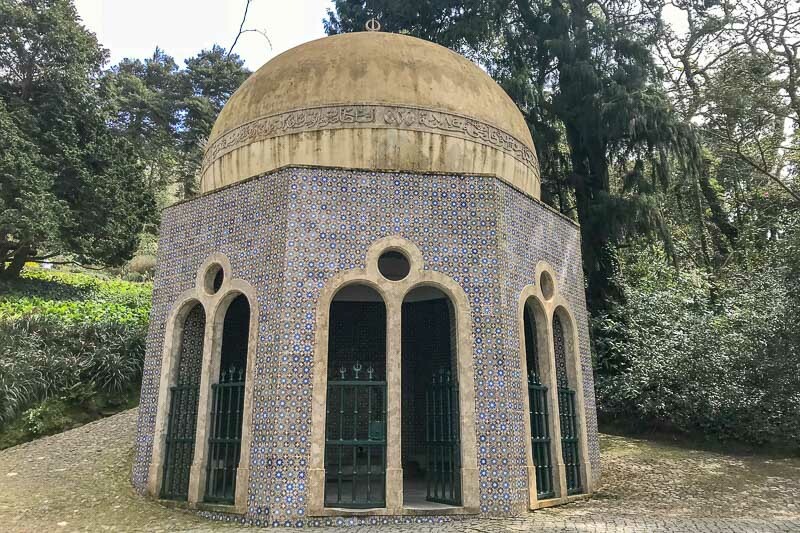 The original has been wired back together as well as it could be, and placed in a more protected location near the path up to Pena Palace. We started back down the high, and wandered through the gardens to the Valley of the Lakes. 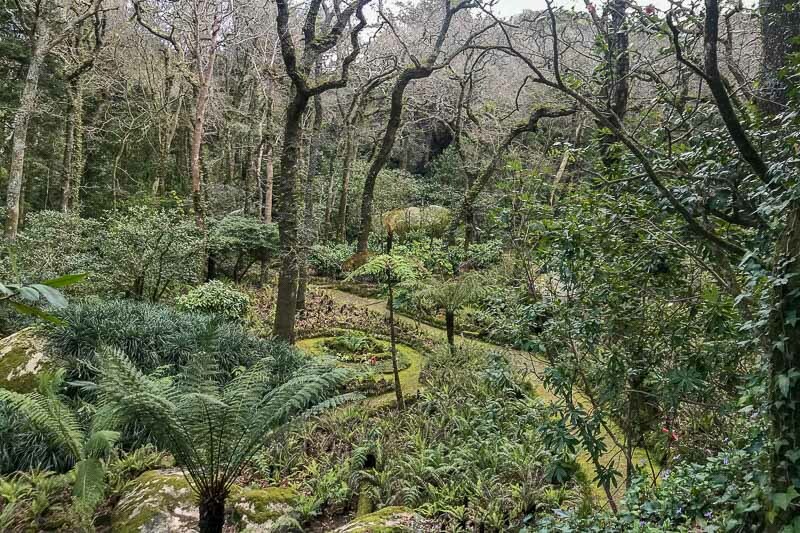 Do not expect symmetrical manicured gardens here, instead the gardens blend into the natural forests of the area. The lakes at the bottom are really duck ponds, including elaborate houses for the ducks. Outside of the gates here we caught the hop-on hop-off bus back into the town of Sintra. Both bus trips we had taken so far took much longer than we had expected as traffic was crazy. We had hoped to perhaps stop at one of the other attractions along the way, but we were running out of time. By taking this bus back into town we had completed one of the loops, and at least glimpsed all the attractions and heard the commentary. 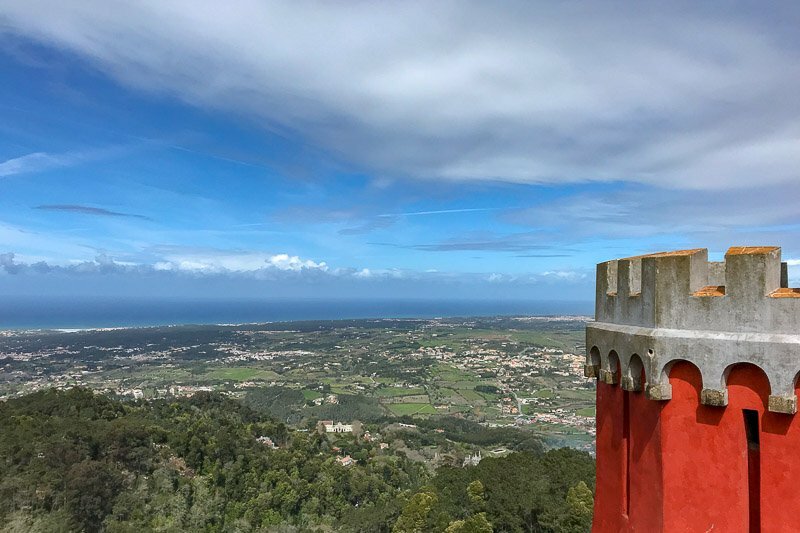 We had a quick look around Sintra, then had some lunch at one of the many restaurants right next to the National Palace, with it’s distinctive white towers. 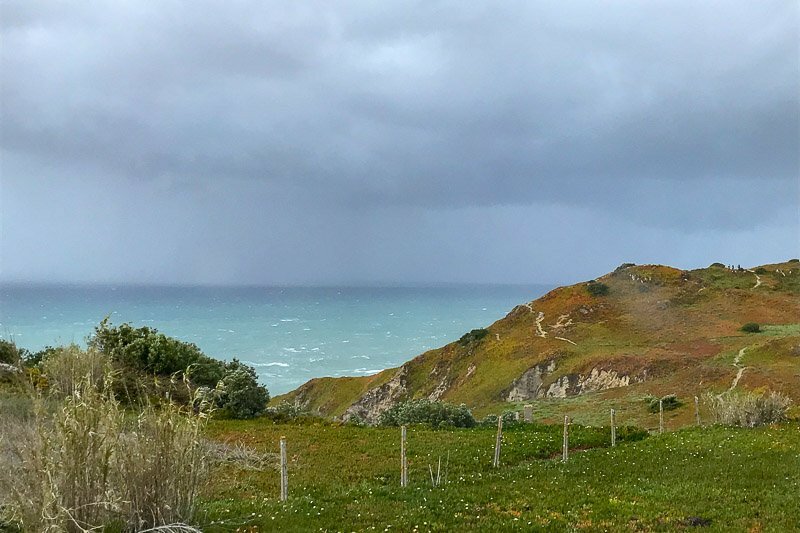 Our plan for the afternoon was to catch the next bus on the other loop, which would take us all the way out to Cabo da Roca, the western most point of mainland Europe. We could jump off the bus, have a look around, then catch the next bus back into Sintra for the trip home. Unfortunately though, we were waiting at the busy bus stop in the middle of Sintra, our bus came along – then drove straight past! Boy were we not happy! The next stop was the train station, and since this was the start/end of the bus routes, the buses often stayed there for a few minutes before beginning the next loop. We decided to quickly walk the ten minutes there and hope the bus was still waiting. About three minutes into the walk it started to rain again. And did not stop. We ended up having to stand in the rain at the bus stop for over half an hour as the bus was not there waiting for us. There was no shelter close, and we didn’t want to go too far since clearly the buses were not running to schedule. Eventually a bus turned up, and luckily the driver said yes, he was still doing the whole ninety minute loop out to Cabo da Roca, but he was the last bus for the day so we either had to stay on the bus or make our own way back to Sintra. Due to the rain, we decided to stay on the bus, but this meant we only got to see the area from the windows of the bus! 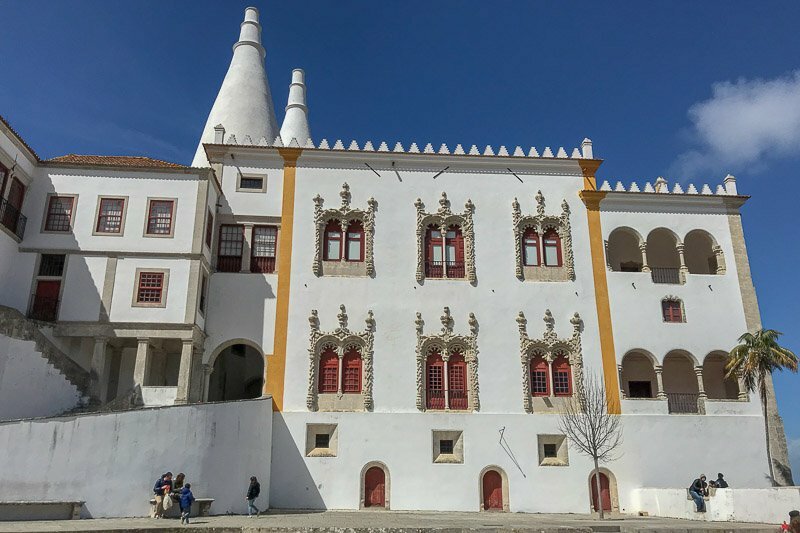 I was a little disappointed that we didn’t see as much as I had hoped in Sintra. Next time I would go armed with a plan from the start. Work out how you are going to get around, and where you want to see most. There are public buses that will get you to most of the main attractions, but lineups were long. We visited on a holiday (Easter Saturday) but it was still considered to be the winter season, so the buses ran for shorter hours. I am not sure if we just chose a bad day, because I can imagine the summer crowds would be crazy here too. Well worth the visit though, there is so much to see and I feel like we missed things. 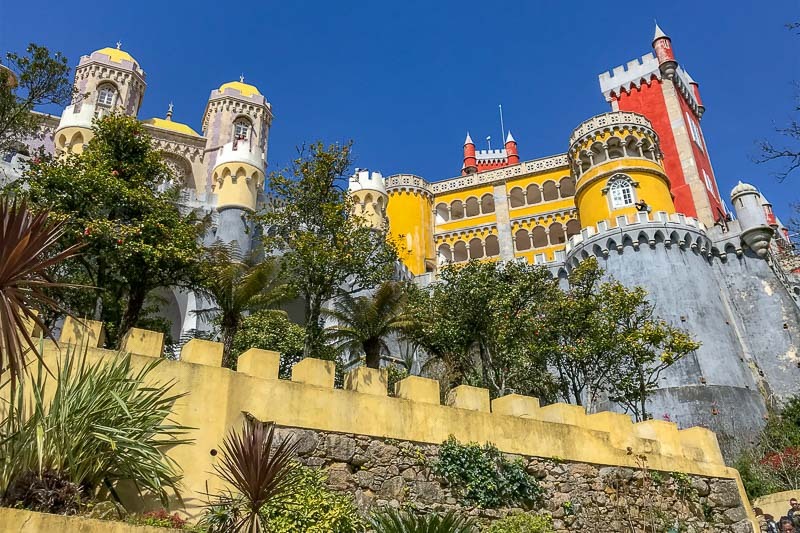 I will likely plan another visit to Sintra one day, maybe even a night or two because the town looks lovely. Once we arrived back in Lisbon we spent the evening getting food and looking around in the shopping centre across from the train station. We were still hunting for the elusive discontinued Pull & Bear t-shirt our daughter wanted us to bring home (we don’t have Pull & Bear in Australia) and the shopping centre was dry and warm! Eventually we made our way back to our AirBnB, checking out the artwork for the last time before we leave in the morning. This was a nice taste of Lisbon, but we really did only brush the surface. It feels like such a summer place, and I can really imagine the city coming alive on warm nights. We will definitely be back again. Public transport was good. We used trains and buses almost everyday. We bought a transport card at the airport on arrival and added some credit, using that on all the services. We saw, but didn’t ride, the famous Lisbon trams. If you are here, the number 28 trams goes through a lot of great neighbourhoods and I will be giving it a try next time we are here. Some of the Lisbon trams. 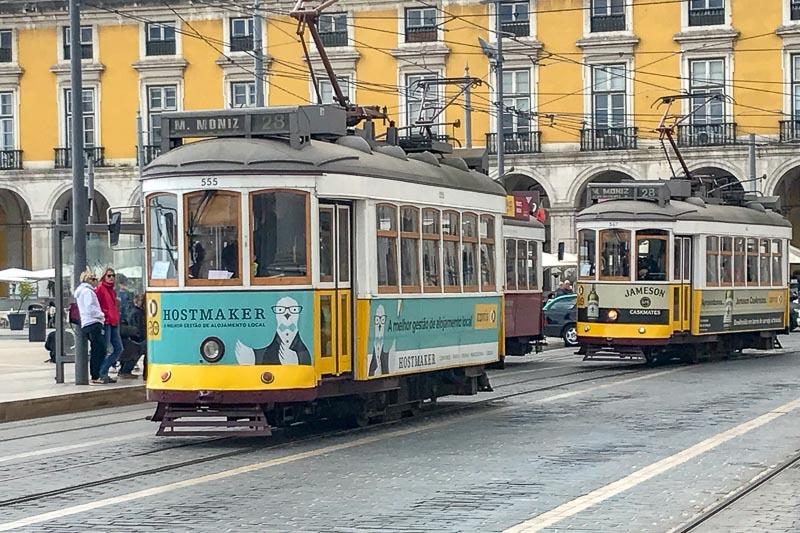 Almost all the trams in Lisbon are still this old style. One one route uses new trams. On arrival in Lisbon we finally got the SIM card I had been planning to get a month before when we arrived in Europe. This meant we were no longer reliant on wifi, so didn’t notice as much if it was available. The internet was fast in our AirBnB, and wifi was available in the shopping centre we were in, and places we ate at. 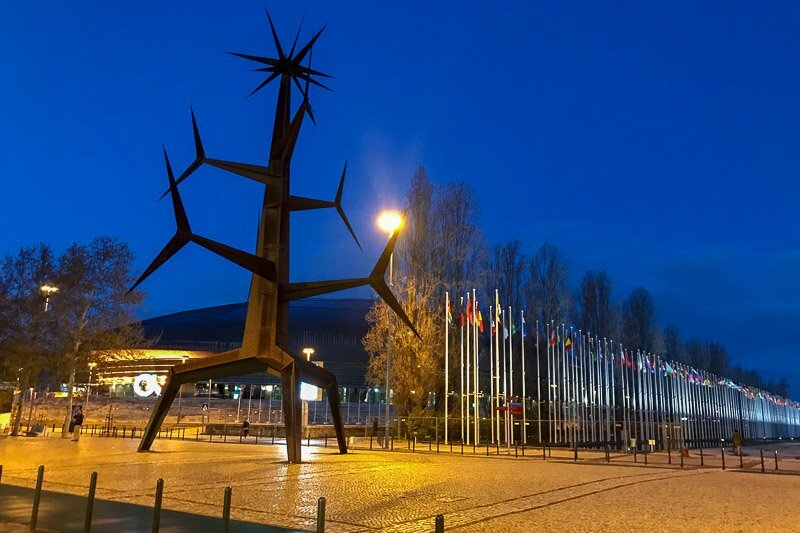 Portugal is one of the cheapest countries in Western Europe, so there is always something to be found that is value for money. We didn’t eat out much in Lisbon, but the times we got lunch out it was around €8-10 per person. I could spend a lot more time in Lisbon and Sintra. 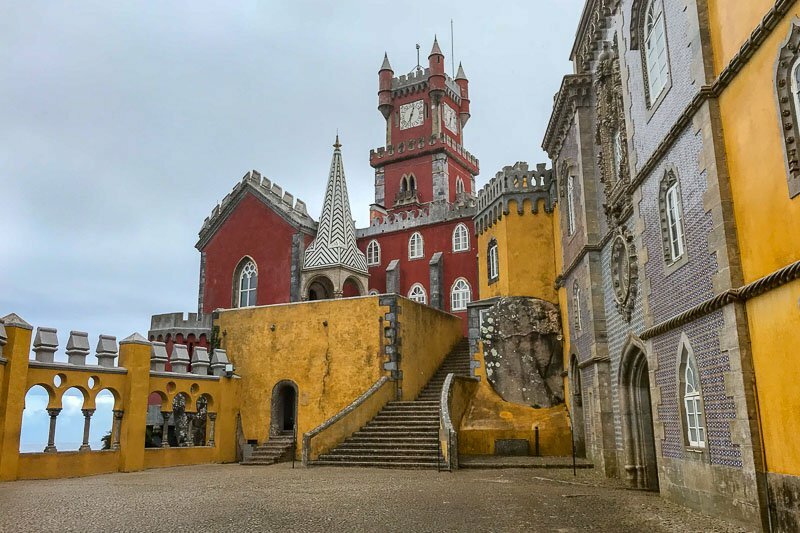 Our own visit to Sintra was pretty chaotic, but we saw some great stuff. Hired a car and drove to Cabo de Roca, then onto Sintra where there was zero parking. Kind of difficult to pick public transport and its often imperfect routes and timings, or hire a car and find no parking at the good places. Good tip on the Sandemans tour. Loved the one we did in Paris. Will keep an eye out for them in future. Thanks Pete. I can totally see how trying to park would have been a nightmare! Even at some of the attractions out of town it would not have been easy do to narrow roads and very limited places to park. 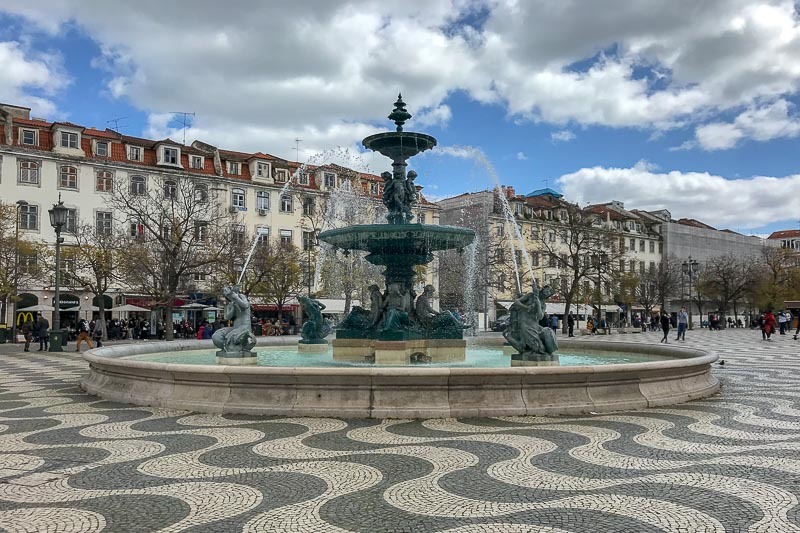 Pleased to read this blog and to know you enjoyed Portugal and plan to return. Its definitely on my List. 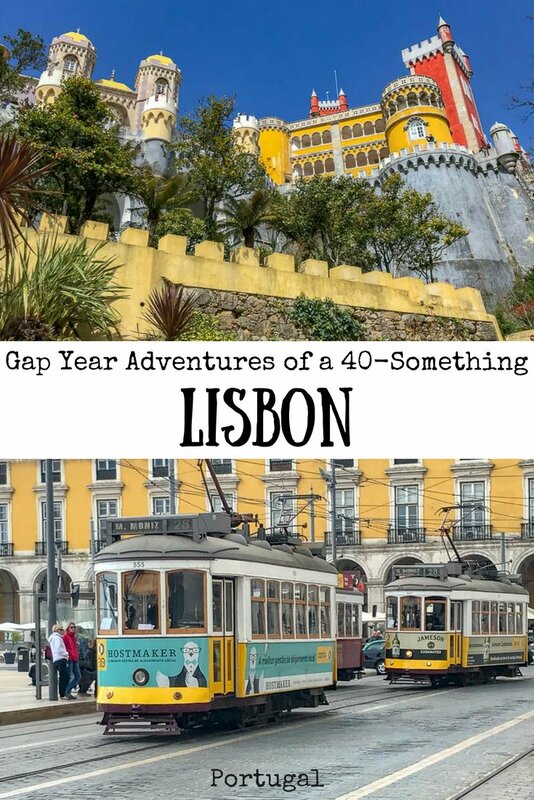 Portugal would be up there in the top few countries of our gap year. It definitely packs a punch and I can see why it has become so popular. Keep an eye out for my next post on Porto, which I think I liked even more than Lisbon! Don‘t miss the tram no. 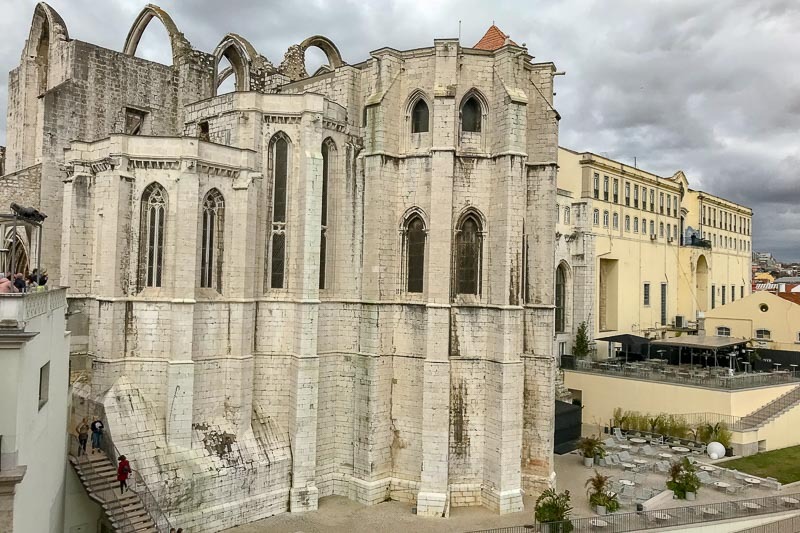 28 through the Alfama – the old city. It drives through the narrow and tiny lanes. I remember that we jumped(more falling) though the entry of a little grocery as the tram passed behind us. And the visit of the aquarium it really worth. They builed it for the World exhibition.